If you've ever seen dog/wolf documentaries, these canines usually take shelter in a den or cave, raise a family, or is basically like a home to them. Its a place where they can sleep safe and sound without becoming another animal's meal. Basically, what crate training does is to replicate that setting and be placed within your home. Crate training has often been used by many dog owners to first, confine a new puppy within an area until it is house-trained, and secondly, to simulate a den that a dog would use in the wild: for protection from animals and the weather. So don't be surprised if your pooch runs into the crate when there's a thunderstorm or if fireworks are going off all around! To elaborate on the puppy crate training and house break-in: dogs do not like to dirty their living space. So, by confining your puppy inside the crate, it will more likely resist eliminating inside the crate. This is good, because when you release your puppy, you can bring it to relieve itself at a spot or area that YOU WANT and reward your puppy for doing so (think positive reinforcement). This is also very useful for training your pup to control its bladder and bowel movements, and to relieve itself at your scheduled time. HOWEVER, a word of caution: please DON'T LOCK YOUR PUPPY IN THE CRATE FOR EXTENDED PERIODS OF TIME. The short term confinement is specifically meant for you to prevent your puppy from eliminating when confined. If you have to be away from your puppy for a short time (i.e. convenience store trip), then it is still acceptable. But please do not lock your dog inside the crate for a long time. This could cause your dog to think that its his punishment to be locked inside. That is completely the opposite of what the crate is for! For the proper uses of crates, have a look at our training here. You should let your pup out at night when you sleep. You could consider placing the open crate in a caged area with training/pee-pads or newspaper. NOTE: It is highly recommended that if you were to use this method of spray and pads, try to use the same kind of potty training spray for the duration of your dog's training. Preferably, his life too especially if you want to train him to eliminate in a new place i.e. a new home or garden). This will help your dog form strong associations with the spray and eliminating at the sprayed area. Different sprays will create different scents, which might confuse the dog. So the procedure for training is simple. You must be at home when you're crate training your puppy. At intervals of every hour ( or every 2 hours), let your puppy out. Leash your pup, and immediately take him outside/to the sprayed pad. The pup should eliminate within 10 minutes. Don't forget to reward your pup with treats/praise/longer walks or just play around the house when he successfully goes! If the pup doesn't, don't worry. It might not have been time. Simply return your pup to the crate. You might also want to keep a schedule of the times you feed your dog and his elimination time. If done regularly, your pup should have a regularly scheduled elimination time. 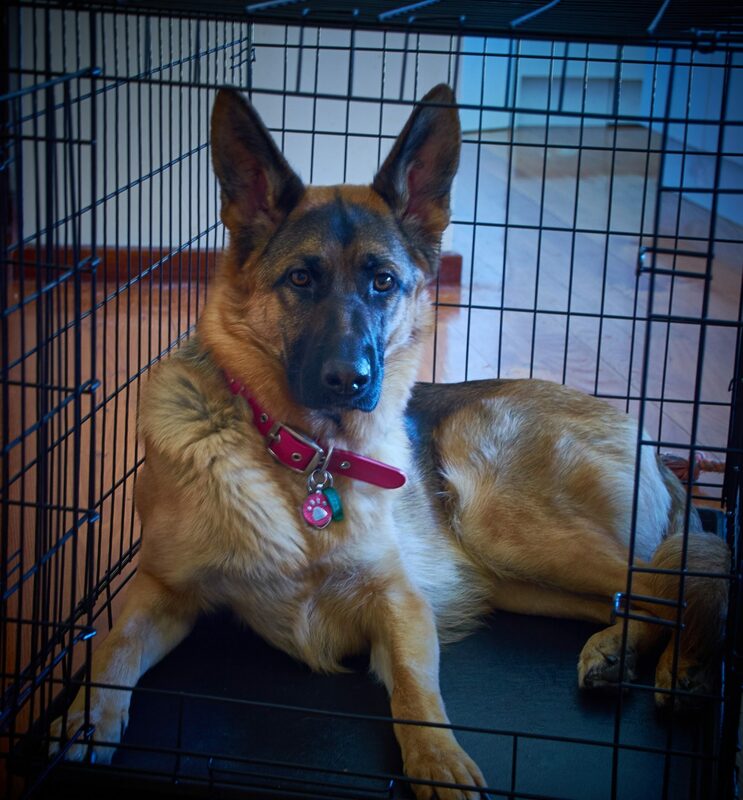 If you release your pup from the crate and find that he has eliminated at an undesired area, don't punish the pup! It simply means that its still too soon to have allowed your pup to have free roam of your home. Simply clean up the mess, and resume crate training until you're sure you can trust your dog free run of the house. For rescue dogs, you can utilize this technique as well! However, it might take a longer time to crate train a rescue dog, as they might be older and thus, slightly more stubborn to orders. Give them time to adapt to your rules, and they'll be fine! For those still having some issues with crate training, not to worry! Come have a look at our trial training and let us help you with crate training your dog.